Coming down your way in December again and would love to bolt up a rear brake kit. How's the development of it coming along? Rear discs have landed for the Ford rear, using the Territory calipers This now completes the look of our brake upgrade for the Falcon. rear discs are still going perfect in my car too brett, no complaints! Just to double check I need to supply territory calipers / pads and braided lines? Cheers Brett, how much of a difference would the braided lines make on the rear, and would the same as you supplied me on the front kit work on the rear? 10 FG G6ET - Rocket-powered lounge suite. We have a radial vane design which I think is better for heat dissipation and our discs are high carbon so will last a very long time. The major part of the rotor is the alloy hat so should be lighter. 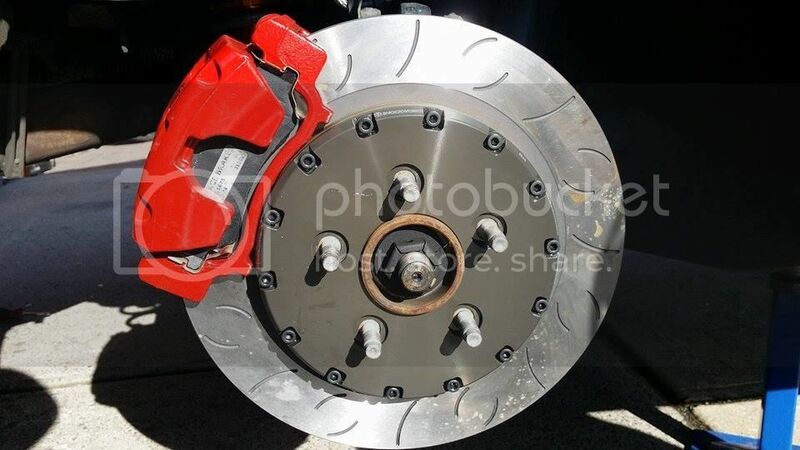 To all forum members, our new design rear brake discs for $720 a set (plus delivery) which is $100 until we sell out. We have about 8 sets left at this price. For any orders just send me mail to brett.obrein@shockworks.com.au. I will then send you our account details. If you can supply your address and contact number for the freight company that would be good. Freight QLD and WA is @60 and NSW, SA is $40. Hi Brett - will your rear disks suit an FG ute ? At this stage we only have the rear discs for the IRS rear but working on the ute next. Do you have a two piece rear rotor to fit the fpv 330 x 28mm? Are the ute and irs part not the same? OEM are aren't they? Chris & Craig - Thanks!